Copper has been the dark horse of the metal world for a while now. 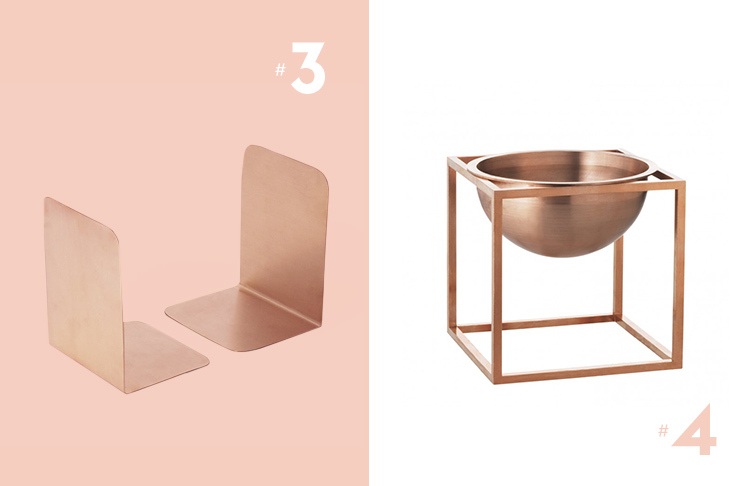 Understated, to gold and silver’s flash and gawd, copper has served many a functional purpose before some genius decided to put its bronzed patina to better use: as homewares. We can’t be certain when the trend started, we’re just grateful it’s hung around to brighten our homewares hunting. 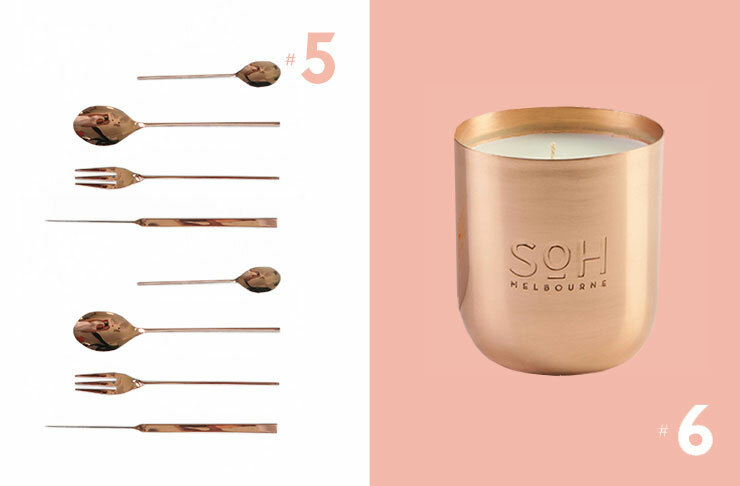 From the perfect accent for your all-white-errythang room to luxe statement piece that scores serious points in the interiors game, here are eight of the best copper homewares to up the ante on your home decor. 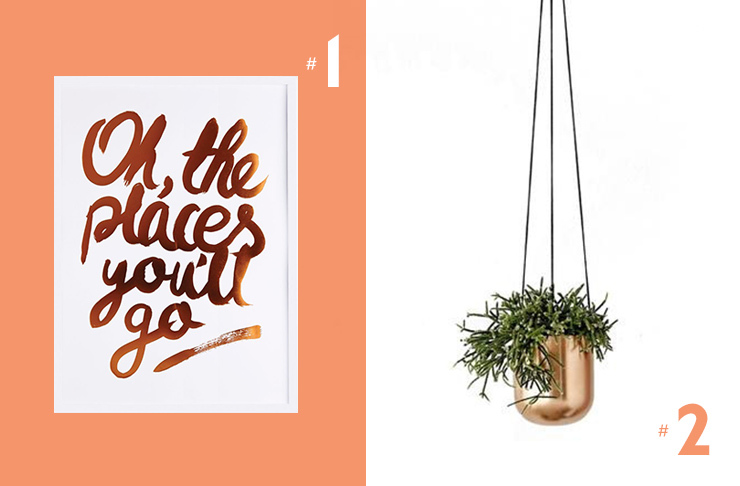 Dr Seuss would more than approve of this shiny copper Oh The Places You'll Go Copper foil print from Melbourne-based homeware lovers Hunting For George. Hang it in your study or office for mid-work inspiration and dreaming sessions. Be kind to your greenery by making its home this hanging copper planter, from Perth retailer Granite Lane. Indoor plants + metallic highlights + white walls = a winning Insta combo. Shop online or visit them at 11 King William St, Bayswater. Book nerd or not, these brushed copper bookends will rock any shelf no matter what it’s holding. It’s not all about looks either; they’re heavy duty enough to keep the lengthiest of tomes in place. Find them online at Cranmore Home, or pop into their shop at 66 Padbury Street, Moora WA. A bowl that has its own stand must be a king amongst bowls but the Kubus bowl is a Bauhaus-inspired thing of beauty to boot. Think outside the bowl box; turn this bad boy into a planter, a vase, a centrepiece full of fruit, or even eat your breakfast out of it if you’re feeling particularly bourgeois. Make it yours at Melbourne-based online retailer Designstuff. If your cutlery draw is sorry state of affairs, jammed full of bent and rusty cutlery then treat yo’ self to a real adult purchase with this cutlery set from Sydney online shop The Minimalist. Now you can host those schmancy dinner soirees without cringing every time someone takes a bite. Fire hazard be damned, we want to burn this sleek copper fig tree soy and coconut wax candle 24/7. You’ll be addicted to the scent of fig trees and balmy nights in no time. Available from Perth-based online retailer Elva Hem. Hero lighting fixtures, where have you been all our lives? This beaut triangle pendant light from Auckland retailer Douglas and Bec is part functional item and part classy showstopper. Let this light into your life pronto. Shop online or visit them at their showrooms in Melbourne and Auckland. 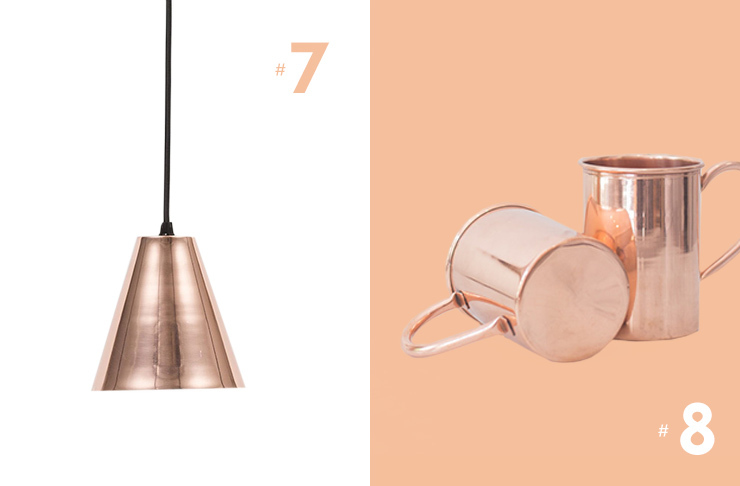 Your homewares swag wouldn’t be complete without a rustic copper mug to jazz up your daily sipping. Use it for hot drinks or cold, or be a rulebreaker and use it as a vase, as any self-respecting hipster would. Available from Brisbane retailer Showroom either online.